Mohamed Salah is the first Liverpool player to reach 30 goals in a season since Luis Suarez (2013/14). Nobody was expecting Salah to be able score 1 goal every 90 minutes. What is the secret? The positioning heatmaps indicate that the Egyptian is playing closer to the goal, which allows him more shots (4.6 per 90 minutes vs 3.0 last year) and with a better xG per shot (0.18 vs 4-year average of 0.16). Mohamed Salah Ghaly was born on 15 June 1992, in Nagrig, Egypt. Nagrig is a village located about 120 km northwest of Cairo, deep in Nile’s Delta region, a rural area. Salah started his career with El Mokawloon, where he made 38 appearances and scored 11 goals. His destiny changed forever on 16 March 2012: Basel organised a friendly match against the Egypt U-23 team. 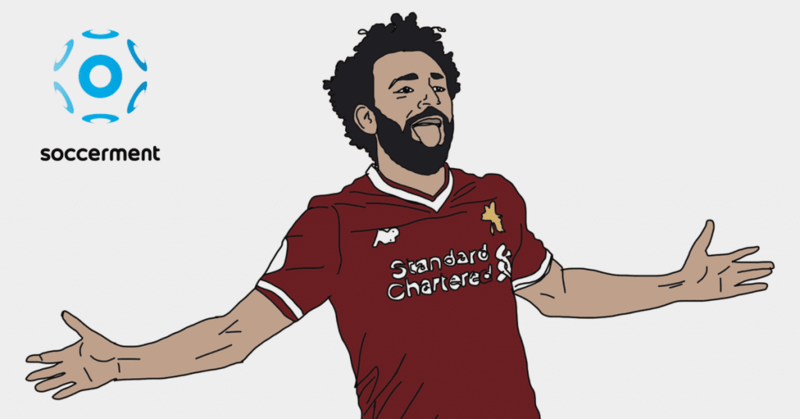 Salah only played the second half, but scored twice and led his team to win 4-3. He signed for Basel on 10 April 2012. What followed, i.e. 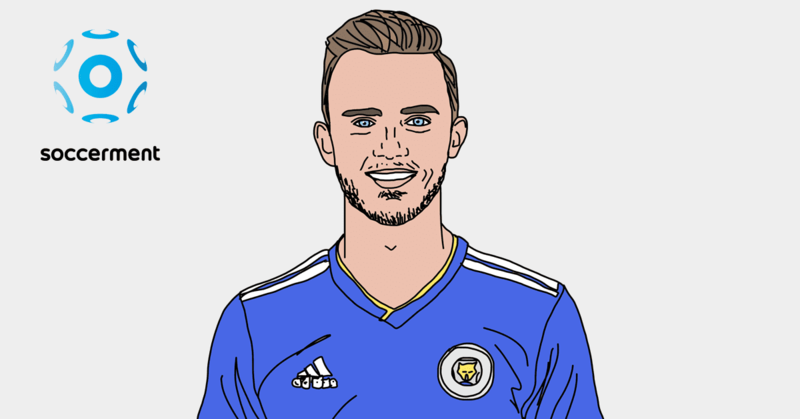 the transfer to Chelsea, a loan spell for Fiorentina, a loan spell for Roma (which became permanent in Aug 2016) and the transfer to Liverpool, is well known. On the contrary, not known and not very much predictable was the impact that Salah would have had on Liverpool’s scoring table this year. Salah’s historical data, this season included, talk of a player able to score around 0.5 times every 90 minutes. 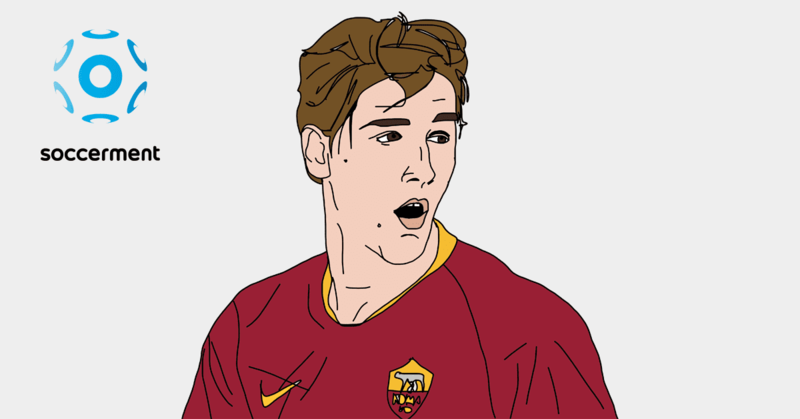 In a normal season (34-35 matches, 80 mins per match), this would equal to around 15 league goals, which is the level he reached over the two seasons he played for Roma. However, this year, in 26 EPL apps, he has already scored 22 goals. We were not expecting this. 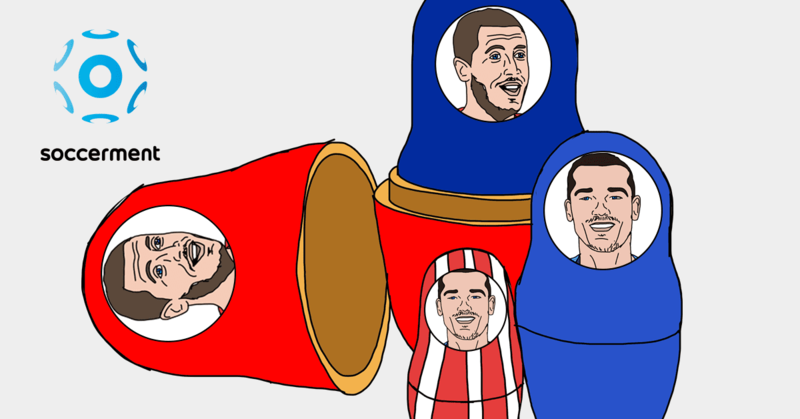 In fact, we did not include Salah in the possible EPL topscorers, back in August (see our post). 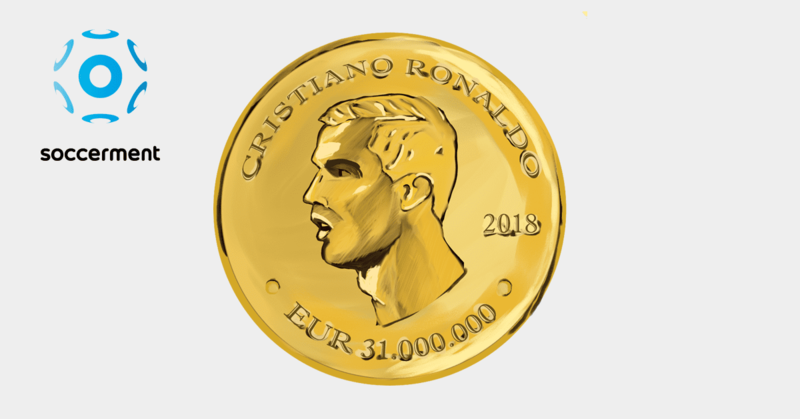 Roma was, most probably, not expecting this either, otherwise they would have sold him for more than €50m (including bonuses); according to transfermarkt.co.uk, his market valuation now exceeds €80m. Further, we even doubt that Klopp was expecting this. So, how was this possible? 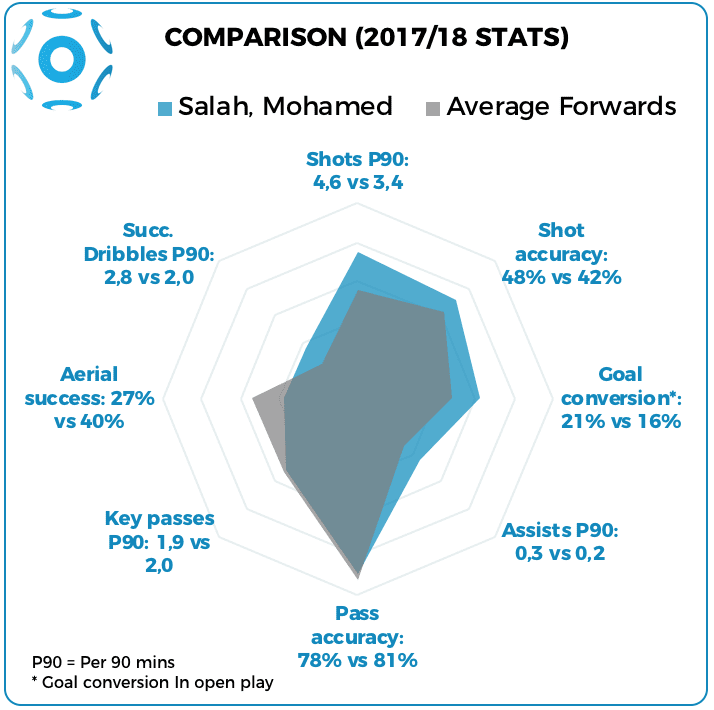 In the spider chart below, we compare Salah’s performance stats against the average of European top forwards, for the current season. He is scoring more goals as he is shooting more often (4.6 vs 3.4 per 90 minutes) and with a higher level of accuracy (48% vs 42%). 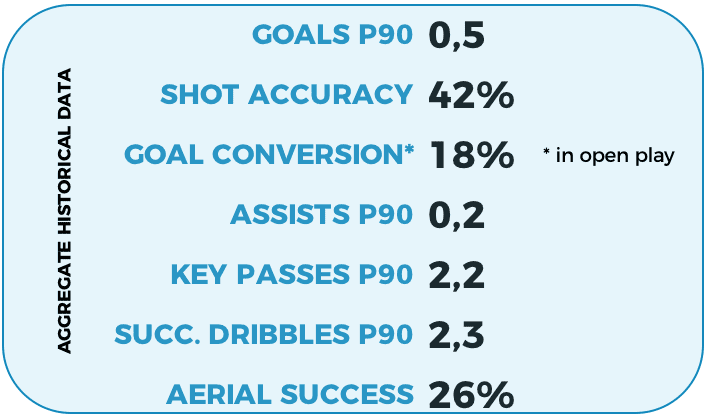 He is also providing more assists, despite a slightly lower-than-average number of key passes. 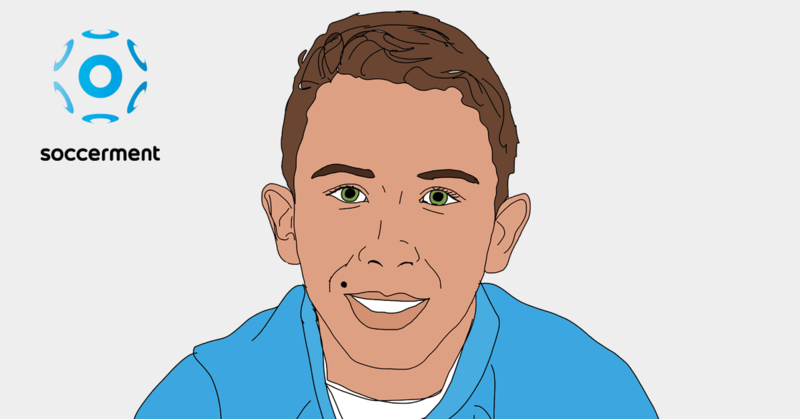 This might have to do, inter alia, with Roberto Firmino’s higher-than-average shot accuracy (43%). We note that Salah’s number of shots per 90 minutes has increased by more than 50% since last year. Mirroring the higher attitude for shooting, the number of key passes per 90 minutes has dropped by almost one-fourth, year-on-year. Basically, Salah seems to have become more of a forward and less of an attacking midfielder. We had a look at Salah’s positioning heatmaps (chart 4, below). On the left hand side, we show the current season, while on the right hand side, the average heatmap related to 2016/17. We note that, at Liverpool, Salah has indeed been playing much closer to the goal, as compared to the average position on the pitch he maintained playing for Spalletti’s Roma. 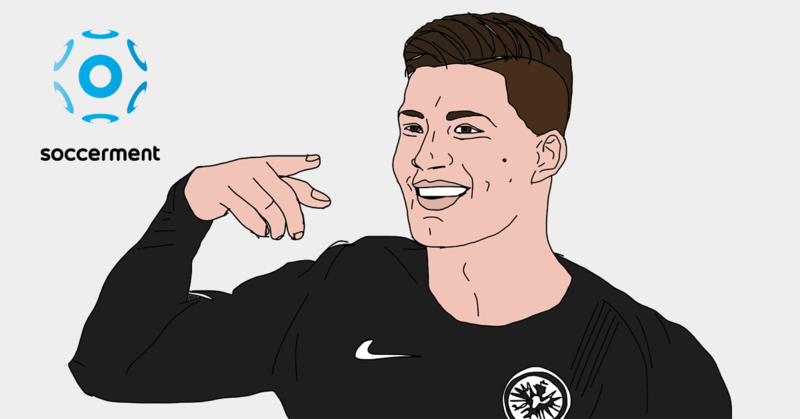 As a result, he is shooting more often and from better positions: whilst at Roma, last year, he took 76% of the shots from inside the box, this year that percentage is around 79%. This is also confirmed by the xG per shot this year (0.18) compared to his four-year average of 0.16. All in all, in the current season Salah has taken on average 3.6 shots per 90 minutes from inside the box, compared to 2.2 in 2016/17. 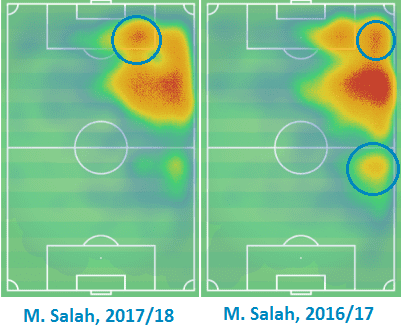 From the heatmaps, it also seems that Salah is undertaking fewer defensive tasks. This is numerically underpinned by the lower number of attempted tackles per 90 minutes (0.8 vs 1.5 last year). 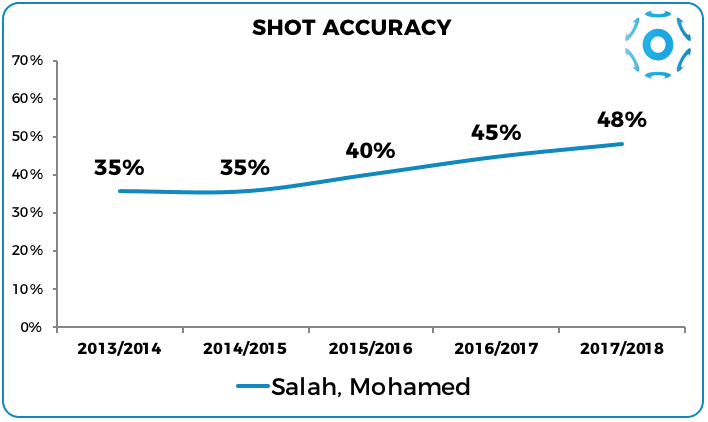 We believe this might be beneficial to Salah’s shot accuracy (as he is fresher when he attacks), which has improved to 48% from 45%, as the chart below shows. In the past four years, Mohamed Salah has shown quite a high consistency when it comes to outperforming xG (with a lower-than-average volatility). 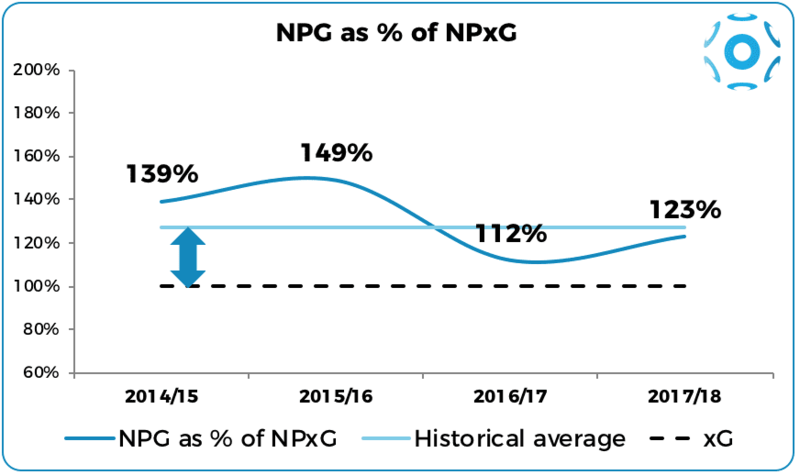 Salah’s number of non-penalty goals, as a percentage of non-penalty expected goals, has remained at around his average level of 127%. Interestingly, so far this year he has actually slightly underperformed his own standards (123% vs 127%), which makes us positive regarding the rest of the season. We highlight that Kane’s non-penalty goals as a percentage of non-penalty xG this year stands at 106%, vs a four-year average of 122%, while Aguero has been doing better vs his four-year average (117% vs 105%). These numbers would suggest that Kane has a higher probability than Salah to become the EPL top scorer this year. And that Salah seems better positioned than Aguero. Liverpool are in good form, with 3 wins in the past 5 matches. In the upcoming 5 fixtures in the EPL, four matches seem affordable: the Reds will play West Ham Utd (H), Newcastle (H), Man Utd (A), Watford (H) and Crystal Palace (A). These teams have conceded 1.4 goals per match, on average (1.6 excluding Man Utd). That is the same average (1.4) of goals against of the next opponents of Harry Kane’s Tottenham (Crystal Palace, Huddersfield, Bournemouth, Newcastle and Chelsea) and of Sergio Aguero’s Manchester City (Arsenal, Chelsea, Stoke City, Brighton and Everton). Who will be the top scoring leader at the end of March? 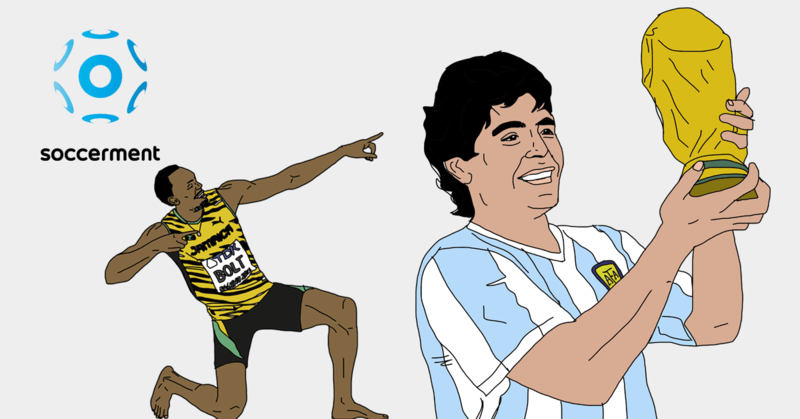 Who is going to be the EPL top scorer at the end of the season? Let us know your thoughts. Credit: the data were sourced from WhoScored.com and understats.com. 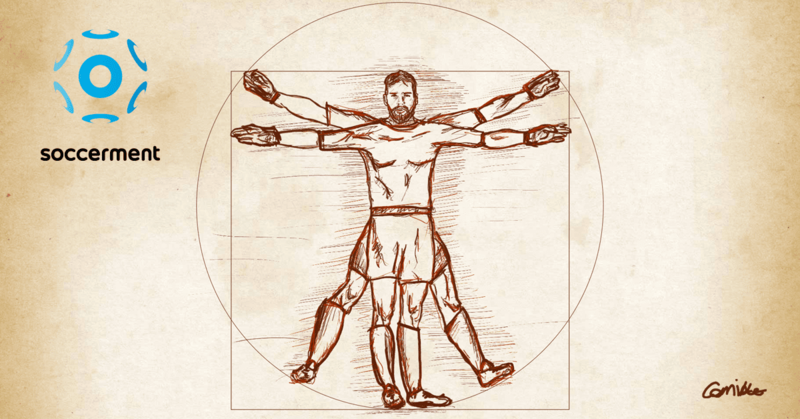 For any suggestion, query or additional information, do not hesitate to send an email to: research@soccerment.com. Give our email list a try! 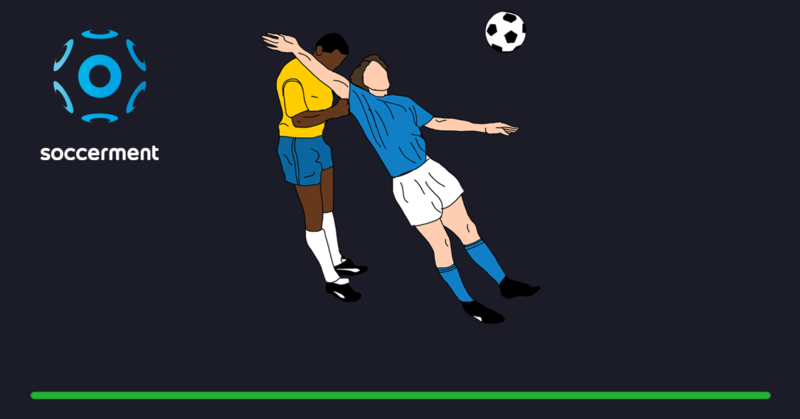 with all of Soccerment’s valuable insights.